The indictment revealed for the first time the extent to which Russians tried to sow political discourse in the US in the run-up to the 2016 presidential election. The Russians weaponised social media to organise political rallies, both in support of and against certain candidates, according to the indictment. Although the Russians organised some rallies in opposition to Trump’s candidacy, most were supportive. “To conceal the fact that they were based in Russia, Defendants and their co-conspirators promoted these rallies while pretending to be U.S. grassroots activists who were located in the United States but unable to meet or participate in person,” Mueller’s indictment read. The rallies, which began in June 2016, took place both before and after the 2016 election, spanning New York, Florida, and North Carolina. To promote the rally, the Russians purchased ads on Facebook and privately messaged people encouraging them to participate, even offering to reimburse some of their travelling expenses. They also solicited support from a volunteer for the Trump campaign in New York, who agreed to supply the rallygoers with signs. They used many of the same techniques to spread the word about the rally, including buying ads on social media, contacting grassroots organisations, and communicating with unwitting Trump campaign volunteers. Later that summer, the Russians extended their operations into Florida, a critical battleground state in US elections. They coordinated with Trump campaign staff, who were unaware they were working with Russians, to organise the rallies, and paid real Americans to perform specific tasks during the protests. Throughout the rest of the campaign cycle, the Russians continued organising rallies mirroring previous ones staged in New York and Florida. They communicated with unwitting Trump campaign volunteers, promoted the rallies on social media, and paid individuals to perform certain tasks. 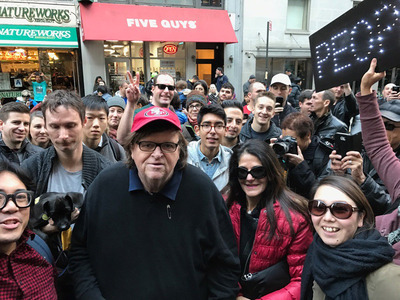 TwitterMichael Moore, a left-leaning documentary filmmaker, attended an anti-Trump rally in New York on November 12, 2016. The event was allegedly organised by Russians. Russian interference didn’t end with Trump’s election victory. Shortly after the November vote, the Russians helped organise several pro-Trump rallies at the same time they organised anti-Trump protests, calling on people to object to the election results. On November 12, the Russians helped coordinate an anti-Trump rally that drew as many as 25,000 people, according to NBC News. Fox News reported that Michael Moore, the prominent documentary filmmaker who strongly opposes Trump, attended that rally. About a week later, the Russians organised a protest called “Charlotte Against Trump” in North Carolina. These rallies represented just a fraction of the dozens of other rallies that took place in cities across the US after Trump’s victory. The Russians were also allegedly responsible for organising other rallies throughout the 2016 campaign, although these were not outlined in Mueller’s indictment. According to The New York Times, a group of about a dozen protestors in Houston, Texas, met to protest “the threat of radical Islam” in May 2016. That group was met with dozens of counter-protestors, drawing a large local police presence. Both groups were organised by Russians.